A conjugation of a verb is a list showing the different forms a verb may take. When a verb is conjugated, it is usually accompanied by all of the personal pronouns which can act as subjects of a verb. Thus, a conjugation can show the different forms a verb must take when it is used with different subjects. It should be noted that in modern English, the same verb forms are used with the subject you, whether you refers to one or more than one person or thing. In an older form of English, there was another personal pronoun, thou, which was used with different verb forms, and which generally referred to one person or thing. 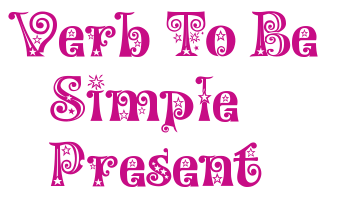 The Simple Present of the verb to be is conjugated as follows. In spoken English, contractions are often used. In written English, an apostrophe: ' is used in a contraction, to indicate that one or more letters have been omitted. An affirmative statement states that something is true. In an affirmative statement, the verb follows the subject. In the first example, the verb am follows the subject I. In the second example, the verb are follows the subject they. In written English, statements are always followed by a period: . Statements and questions must begin with a capital letter.